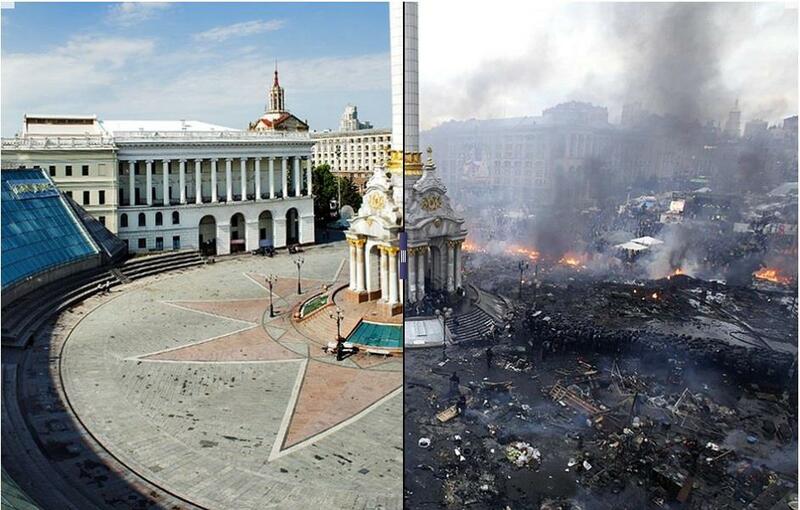 At this moment (February 20, just after lunchtime) it is apparent that the Ukrainian Revolution has triumphed. The question remains how long will it take and what other losses and human victims will there be before this victory becomes obvious to all without exception. The Yanukovych political era is experiencing its final days and hours. The remnants of conscientious MPs from the presidential Party Regions are urgently leaving the party and their respective factions at the Ukrainian Parliament en masse. It is exactly for this reason the Ukrainian political regime has put everything at risk, as witnessed by dozens of corpses with gunshot wounds in downtown Kyiv, the work of snipers this very morning. The biggest mistake made by the Russian authorities in this situation was the reliance on a criminal regime whose legitimacy had been undermined on November 30 – after the brutal dispersal of the students of EuroMaidan by “Berkut” [special riot forces] police – and was entirely destroyed after the mass shootings of protesters on Maidan Nezalezhnosti [Independence Square] by the Interior troops (which happened on the Day of Mourning). And all has been taking place against the backdrop of the Winter Olympics in Sochi. Putin prepared for these games for seven years – they were supposed to become his personal triumph, a way to memorialize his name and efforts in history. (The exorbitant amount of money spent on the Games has been estimated, but that’s another story.) The Opening Ceremony was magical and stunning. And during the Sochi Olympics Closing Ceremony, Ukrainians will be burying dozens of the dead in Kyiv and other cities throughout Ukraine. How do the events in Ukraine seem to be related to the Olympics? The Russian factor has obviously become one of the main drivers of the current events in Ukraine and a counter-revolution by the Yanukovuch “family,” and his entourage in particular. It is also apparent that victory of the Revolution in Ukraine will have a tremendous impact on the Russian political process, its system, and on Russian politics itself. This entry was posted in "Voices" in English, English, Languages, Maidan Diary, Voices of Revolution and tagged #Amnesty_International, #Євромайдан, #евромайдан, #Human_Rights, #революціягідності, #ukraineprotests, #ukrainian_revolution, #whitehouse, Automaidan, civil society, Constitution of Ukraine, Dictatorship, EuroMaidan, Kyiv, Ukraine. Bookmark the permalink. 7 Responses to Ukrainian Revolution has won. Kremlin has lost. Olympic Games will close to the sound of funeral music. very good translation! thank you Erin Pflaum Nikitchyuk! O victorie simbolică a revoluției Ucrainiene: olimpiada de la Soci se va încheia pe muzică funebră. Cît despre “experții” care se tot străduiesc de cîteva zile să ne ajute cu igienizarea creierelor, oricîte teorii ale conspirației invocă, oricît încearcă să ne vorbească despre “ordinea legitimă” și alte lucruri de genul acesta, la amintesc că nici noi, mult mai naivii și pașnicii români, nu am ieșit în stradă în 89 îndemnați de niște agenți, ci doar fiindcă ne-am săturat de România lui Ceaușescu. Pe atunci toată lumea se săturase de România lui Ceaușescu. Azi lucrurile sunt diferite. Unii s-au săturat de România lui Voiculescu_Ponta, alții de România lui Băsescu. Taberele nu pot ajunge la o înțelegere. În 89 România făcea parte din CAER și tratatul de la Varșovia, ambele dispărute între timp. Azi, România face parte din NATO și UE, dar doar una din taberele combatante vrea să recunoască acest lucru. Evident că și România e la o răspîntie, chiar dacă nu curge sînge pe străzi. Foarte bun comentariu. Mersi. Sunt mulţi care nu pot reunoaşte că dincolo de manevre politice, românii în 89 chiar au vrut libertatea. Şi că libertatea este de găsit mai uşor în afara sferei de influenţe a Moscovei. In this article, innuendo,no objectivity. I am in Ukraine. Чи є український переклад? Потрібно! Sorry, no. Original is in Russian (link at the top of the post).